A plane trailing a banner reading “Boycott Hi/Lo Tea! Fight For Full LGBT Rights!” will fly above the beach at Cherry Grove and Fire Island Pines on Sunday, June 7, between 2 pm and 3 pm. The action will underscore the LGBT community’s outrage over the April 20 meeting between Republican presidential candidate Senator Ted Cruz (R-TX) and gay businessmen Ian Reisner and Mati Weiderpass, who subsequently donated money to the Cruz campaign. The two gay men also held an April 14 fundraiser at their Manhattan penthouse for Senator Ron Johnson (R-WI), another anti-LGBT politician. Last week a band of gay activist took to Fire Island this weekend to spread the news and point out which of the Fire Island properties belonged to Ian Reisner’s and should be boycotted in The Pines after the New York Times revealed that Reisner, who also owns OUT NYC hotel, lied about cutting a campaign check to ultra-conservative and anti-LGBT candidate Ted Cruz at the same time that he and his business partner Mati Weiderpass hosted a reception for Cruz in their Manhattan penthouse. Reisner did, in fact, cut a check for $2,700, the maximum individual contribution allowed. While many knew of Reisner’s ownership of the OUT-NYC Hotel complex many are unaware of his specific holdings in the Fire Island Pines. 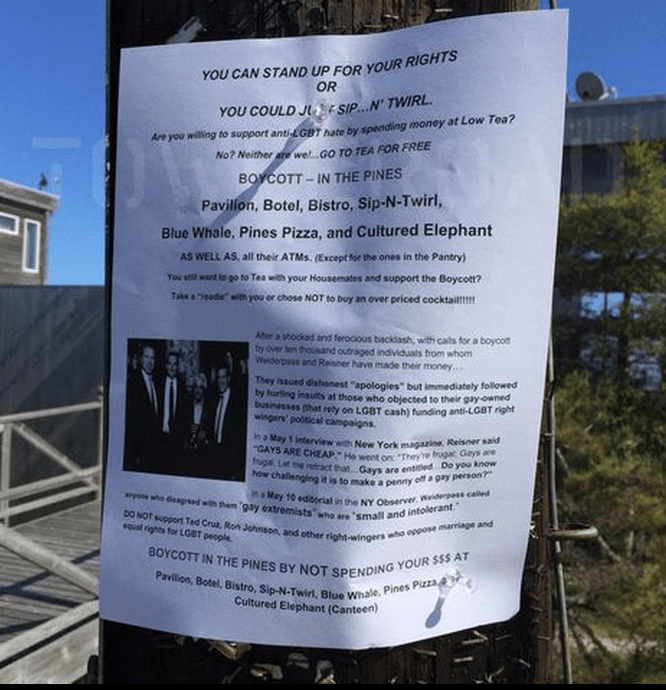 The flyer urges the a boycott of some of Fire Island’s most historic gay landmarks like the Pavilion, Botel, Bistro, Sip-N-Twirl, Blue Whale, Pines Pizza, and the Cultured Elephant. If you would like to learn more check out the Boycott Fire Island Pines Establishments & Out NYC Hotel and the QUEER NATION Facebook pages for further info. Pingback: OUT-NYC Owner Mati Weiderpass Kicked Out Of Fire island Bar Sip-n-Twirl‏. But Was It A Set-Up?